Happy Fall! Happy Halloween! It's your choice what will inspire you for our fourth challenge at Anything But A Card Challenges. Like it's name, this challenge requires you to think outside of the card box and create something different. For my project, I create a chalkboard frame. All the lovely dark purple (including the flower shape) is ready for you to write a message with chalk, erase, then write again. I painted, distressed, then sealed this fun piece of useable home decor. 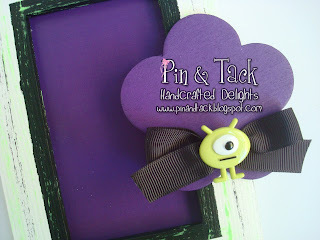 The finishing touches were a smart grosgrain ribbon bow & one-eyed monster. What a creative project. Love the dark purple color and that you can write on the flower also. Fun and creative project! Thanks for sharing with us at My Sheri Crafts! So, so cute :) Thank you for joining us at Penny's Paper Crafty Challenge Blog this time! Good luck in the Challenge. Great idea! Love the vibrant purple in the distressed looking frame. The one eyed monster is hilarious. Thanks for joining our Art With No Boundaries Halloween challenge. I hope you join us again soon. Lovely card,I love the simple but effective layout and the colours are wonderful! This is fun - love all the purple! So glad you linked up at Art With No Boundaries! What a fab frame - love the weathered white against the rich purple!